Your Instructional Coach – Page 2 – Not about what's wrong, but what's next. Being an instructional coach has a lot in common with rubber bands. The work of an instructional coach often involves helping a teacher or administrator stretch beyond their present abilities enough to grow and develop new skills. The really tricky part is to apply just enough pressure to move the needle without a blowout. This was more than evident during one of my first coaching sessions with a young alternative certification intern. Brilliant guy. Not handling his stress very well. 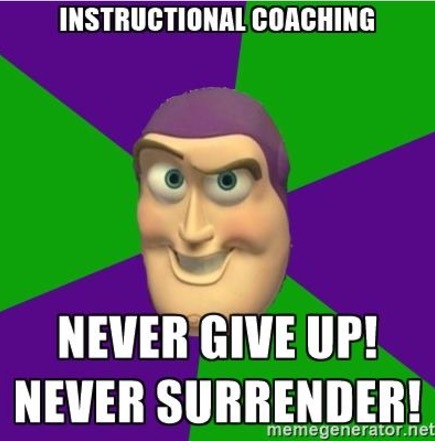 Enter the new instructional coach. Boom! Too much pressure, way too soon. So this got me thinking about rubber bands and I discovered some interesting connections to the work I am doing as a new instructional coach. Here are some of my conclusions. Fact: Rubber bands are sensitive things. Treat one badly and the effect is evident. You’ve seen the kind of rubber bands I’m talking about. The kind that have spent a month or so in the sun, or allowed to dry up, losing much of their elasticity. Maybe you’ve even abused one or two in your lifetime. Corollary: After nearly 20 years in the classroom, I get how much stress and strain some teachers are under. Some are drying up and losing their elasticity. As a coach, I can’t fix that, but I can empathize and take it into account. I also have to assume that it is there, waiting like a tiger in the dark. I don’t want to be part of what causes them to snap. Fact: Rubber gets hot when stretched. According to Scientific American, when a rubber band is stretched, it produces heat. In fact, you can stretch a rubber band and hold it — still stretched — to your face and you will feel a slight warming of the rubber band. Release the rubber band and it will return to its original temperature. Corollary: Coaching is hot work. Working to develop new skills in a teacher or administrator can produce a similar rise in temperature — at least metaphorically — resulting in a higher degree of stress. Releasing the stress will also lower the metaphorical temperature. Fact: Even when stretched, a rubber band will eventually cool down. Holding a stretched rubber band in position until it naturally returns to normal temperature while still stretched will alter the shape of the band permanently. For example, a rubber band wrapped around a folded newspaper for a period of time will heat up, cool down, and then be permanently stretched out of its original shape. It will be slightly bigger. Corollary: As a coach, I have to stretch my coachee beyond his or her normal “shape” and hold the pressure on just long enough that when things “cool” down, the new skill level is retained, resulting in a slightly new and improved model of teaching or leading. Part of my growth as an instructional coach is learning just how long to keep the pressure on so that I don’t “snap” the coachee. I saw this first hand in one of my first coaching assignments, I stretched a little too far and held on a little too long and had to spend some time helping my coachee put it back together before we could continue the coaching process. Fact: If I do not stretch the rubber band enough, it won’t heat up enough so that when it cools the shape is permanently altered. Corollary: When working with a teacher or administrator, one might be tempted to take an “easier” route to a desired growth point out of fear of stretching too far. It’s not exactly about “no pain, no gain”, but if I don’t take my coachee far enough out of their comfort zone to experience the win that comes from improved ability, they will not be as likely to expand enough to ensure permanent change. The sensitivity to know how much is enough and how much is too far is part of the art of instructional coaching. Consider this graphic and the sensitivity required to measure the state of your coachee. Coaching for peak performance requires growth and is going to generate some heat. Coaching is hot work. About our Guest Author: Dr. Harrison McCoy brings nearly 20 years of classroom and administrative experience to his new position at Texas’ Education Service Center Region 11 in Fort Worth, where he is a new Instructional Content Coach. In that role, he supports teachers and administrators in their campus improvement strategies in the service center’s more than 75 school district region. Professionally, he enjoys connecting with educators at a global level, blogging and creating amazing learning experiences for teachers and students. (Note: This is the first of a series of posts by Dr. Harrison McCoy, an experienced educator, but new coach. During his first year in his new role, we’ll hear from Dr. McCoy periodically regarding his journey from teacher to coach). After almost 20 years of teaching students in the classroom, I have accepted a position as an instructional content coach for one of Texas’ 20 regional education service centers. With a shortened summer vacation under my belt, in a week or so, I will be starting a new phase of my career as an educator. So, this week I got a notification today on my cell phone that my school district-provided email address had been locked, and I would no longer have access to its contents. That was the first “official” sign that I was no longer employed as a teacher. Don’t get me wrong, I was expecting the notification, but still, when I saw it in black and white, it gave me a moment of pause. The short answer to that question is a resounding “yes”. I am thoroughly comfortable with the decision that I have made, but that does not mean that I am not very aware of the magnitude of the transition that I am beginning. Coaching, while not a new concept, is emerging as an important part of the vocabulary in many schools and districts across the country. For the past few years, I have noticed a growing number of coaches in the edtech field of education. Instructional coaches are being used at the campus level, at the district level, and even at regional/state levels. Many educators are also becoming self-employed as coaches. Let me be clear about this, however. While I have had the opportunity to lead a lot of professional development over the past three years, I do not have a lot of experience as a coach. My new employers are taking as big a chance on me as I am on them. This will be a period of massive new growth for me. I have mentored a few teachers through the years as a part of informal programs designed to help new faculty members get oriented to their role on my campus, but that is not coaching. I was hired, I think, because I bring broad experience as a classroom teacher and administrator, good communication skills, and the temperament for helping others define and meet their goals for professional success. So, how am I preparing for my first weeks on the job? I’m a Googler, so I have been spending a lot of time searching for a reading what some of the best instructional coaches have to offer. Two names keep coming up, so I am reading a lot of Jim Knight and Elena Aguilar. That’s also how I discovered Eric Sandberg and this blog. I have been adapting and expanding my professional learning network through previous and new contacts on Twitter. I have a cobbled together a Twitter list with 75 or so names of coaches from around the globe on it. I have also accepted an offer to facilitate a Twitter chat about the role of instructional coaching. What are the concerns that I have as I look forward to new beginnings? How will I know if I am successful? I was asked that question during the interview process, and I remember giving what felt like a good answer. It will be interesting to see how this develops. One thing is certain: I am seeing the development of a new standard of personal success for my work as an educator. How will I respond when I meet my first “uncoachable” teacher? What will happen when the irresistible force of my eternal optimism meets the presumably immovable object? There are three things that I am trying to keep in mind as I prepare to begin my new career as a coach, and they come in part from a blog post by Elena Aguilar. Listen, Listen, Listen. Not only do I have a lot to learn about the role of a coach, I expect to learn from the educators that I will be privileged to coach. It’s a partnership and a team, and we will grow together. Adults are different than children and teens. Fortunately, I enjoy professional development and working with adults as much as I ever enjoyed working with students. No problem here. There is no coasting going on here. I am not changing my career to wind my way toward retirement in an easier role. The energy is positive and the pace is fast. Fortunately, I am being placed on a coaching team with a wide varied levels of experience among its members. There is much to learn, but I will be well-coached as I begin my own new journey. I volunteered to write this post and then thought – what am I doing? I have too much to do!! In the next 30 days I will finish the school year, which includes packing up every last item in my classroom; I will also pack up my own belongings to move to another country. I will finish assessments, attend goodbye get-togethers, write report cards, work away at my (upcoming) virtual coaching and consulting business. Besides this, I know there are things I am forgetting or haven’t even thought of yet. I am so blessed to have a job – I sometimes need to remind myself of that. Teaching is a tough one, though. There is always something else to do. Assemblies, meetings, field trips, emails, yard duty, etc., etc., etc. So, I am busy, like everyone else, but I really do want the chance to write to my fellow teachers. There are a few ways this essay could go – I could offer “5 Tips for Surviving the End of the School Year!” or “Why Are Teachers Saddled With So Much To Do?” or maybe even “Why I am Giving Up Teaching to Live Under a Bridge”. What I would really like you to get out of reading this, however, is to know that: you are not alone, that you are allowed to say no if you don’t have time, and that you should never feel stuck in teaching, because you aren’t. Teaching can be a bit of a strange profession because – as I was told as a student teacher – everyone has been to school so there is often a sense that non-teachers know exactly what your job and work environment are like. In reality, however, teaching is a very unique profession and that singular experience creates a camaraderie among teachers. We understand the futility of looking for ‘balance’ when the school year is a series of busy times that flow into one another. We float along with it and mutually search for moments of peace and rest. Be there for your fellow teachers, especially those you see struggling. None of us are alone in this and one way to make things much easier is to know we can rely on others for help and support. Avoid gossip and negativity. Always try to put yourself in others’ shoes. One action I have learned to take as a teacher has made a big difference in my survival in the profession. Nancy Reagan had the right idea – Just Say No. Do not be afraid to politely refuse to do something that is outside your contractual obligations or genuinely impossible if you would like to maintain your sanity for a reasonable length of time. So sarcastic, but honestly: You may be surprised how often a firm but respectful refusal, grounded in sound reasoning, will be granted. The above issues – non-academic events, teacher-stress, lack of support, among other things – are reasons I decided to take a break from the classroom. For the last 6 or 7 years, leaving has felt more like a vague daydream than a real option. The truth, however, is that stepping out of teaching is becoming a more reasonable option all the time. A simple Google search of ‘alternative careers for teachers’ will give you a few ideas to start. You do not have to stay in a mental or physical place in which you are unhappy. There are always options. Life is too short to be stuck. While living under a bridge may just be your life’s dream, if you are choosing to stay above the bridge with the rest of us, please remember: you are not alone, you are allowed to say no, and you are not stuck. I wish you only the very best as you close out your school year – whether for the first or twenty-first time. You have done, in this past year, some of the best work on Earth. Education is not an easy profession. Take good care of yourself. About our Guest Author: Maura O’Reilly is an instructional coach with 16 years classroom teaching experience in 4 countries. She is a teacherpreneur, looking for ways to help teachers so they can feel less stress and more love for the important work they do. You can connect with Maura on Twitter. It’s a lesson we all face from time to time: how to deal when people tell us no. As students, we may have little recourse. As teachers, we can voice our thoughts. And as coaches, we must push others past the no. In US history, many groups are marginalized and told no over and over. Oddly, it happens so much during childhood that kids get used to being told no. They may believe that they cannot accomplish their dreams. Let’s look to Bessie Coleman. Nearly 100 years ago Coleman, an African American, dreamt of flying airplanes. Women then were not allowed to fly airplanes. In fact, African American women were not allowed decent schooling, jobs that paid well, or even basic respect. In spite of these struggles, Bessie Coleman decided she was going to fly. Coleman found the only school that would accept her was in France. She learned French, saved money, crossed the ocean and learned to fly. Coleman inspires. When people told her no, she searched for a different route to accomplish her dream. When there was an obstacle, she found her way through. We cannot always accept it when people tell us no. If our dream is important enough, we have to persevere. Each day we must work a little more, reach a little higher, and hope that the dream gets a little closer. As coaches, we must become the co-pilot in some ways, supporting and encouraging our teachers and student. It’s those moments where we say, “why not?” or find that extra resource. When we as coaches can help make the next step easier, teachers can reach that much further out. Bessie Coleman, the dreamer, teaches us to not always accept no for an answer. If the dream is important, we must help teachers find their way past their own obstacles so that they too can fly like Bessie. About our Guest Author: Elsa Andreasen Glover is in the middle of her first year as an instructional coach at Kaneland High School in Maple Park, Illinois. A National Board Certified Teacher in Early Adolescent Social Studies, Elsa taught 7th graders for 18 years. She holds MAT from Aurora University and writes monthly perspectives at her local NPR station. You can follow Elsa on Twitter at @elsainga. Raising your second child is uniquely different from raising a first. You know from experience how to properly care and nurture your newest edition, but you also forget the struggles of starting over. We tend to “forget” the growing pains, relationship building, and time invested over years of practice. I walked into school on the first days knowing that I needed to be a servant to teachers, honor my commitments, and ask a lot of questions. I knew coming in that I had a large learning curve as I immediately noticed the differences between an elementary and a secondary school. Teachers are absolutely content experts in middle school, students are given a lot of freedom, and teacher-student mindsets are vastly different from those of elementary teachers. I spent the first 9 weeks of school working solely on relationships, even though I was extremely impatient to start doing my “job”. My administrator told me constantly that she didn’t want me to do anything but work on relationships. I had some positive interactions within my first couple of weeks. I was walking down the hallway one day when a teacher asked if I could show her students how to create an “All About Me” iMovie. Little did she know that I had no idea how to do this! I said, “Sure” and quickly learned how to create an iMovie. We typically romanticize the past forgetting the hard parts of the journey. I had forgotten all those hard parts from my elementary school because I had spent 3 years building strong relationships and making myself invaluable. I have had to constantly remind myself to “stay the course” and that “change is slow”. Change is inevitably hard and uncomfortable. As an Instructional Coach you are the “Change Agent” in the building and you have to be stubborn enough to stay the course regardless of speed bumps in your path. This year, I’ve had to define what an Instructional Coach does, lead many professional development sessions, and learn new technology for a 1:1 school district. As the school year is wrapping up I’m reflecting on my accomplishments and failures as I navigate middle school students and teachers. This has been a year of growth and change and often it’s been out of my comfort zone. I’ve learned that best practices are best practices regardless of grade level and content, middle school students are tricky to manage, and that middle school teachers have my utmost respect. I’m going to stay the course and remain focused on the end goal of growing teachers professionally and impacting student achievement. Little Monkeys jumping in your head? Hoopla app in your car as you drive to and from school each day) 10% Happier: How I Tamed the Voice in My Head, Reduced Stress Without Losing My Edge, and Found a Self-Help That Actually Works by Dan Harris. It’s a great book of Dan’s life, including his journey from a panic attack on national television to a happier balanced place. This post is not intended to be a book review, but I heartily enjoyed his style of writing, his humor, and his use of a well-placed foul word or two. I definitely recommend you pick it up or visit Dan’s website or follow on Twitter to learn more. I’m sure in all of our work we’ve all met with the teacher, either in a structured meeting or in a coaching conversation, who has a case of monkey mind. They can’t concentrate on anything, talking about anything and everything that’s not on the agenda, they have a million things to do and only 10 minutes to do them, and they need to go to the bathroom before they have to pick their class up from Music class! As instructional coaches, we are not immune to contracting a case of monkey mind. We’ve all been in the middle of various projects, adding students to assessment software rosters, covering a class for a teacher who has to go to the doctor, meeting with students who have various issues, and all the while trying to keep our laundry list of to do items from spilling out of our heads. At the start of a conversation or meeting, give teachers a moment to reflect on their success and a moment to share (if they are willing). Breathing: I teach students all the time to inhale (Like smelling a flower) and exhale (like blowing out a candle). Even a few seconds of breathing can help all of us calm and refocus. Focus on what we can control and change right now, today, and tomorrow. One last coaching note, when working with teachers struggles and troubles can be seized and turned into coaching opportunities. If the teacher is overwhelmed by grading you might be able to sit down and talk through some strategies for being more efficient. Regardless of the strategy you choose, the goal is to be more mindful of the monkeys in your mind, minimize distractions and bring the focus of the deer back to our work. Good luck taming your mind monkeys!